In honor of Father's Day this month, The National Notary is sharing the story of two Notary dads who have created winning business teams with their children.Succeeding as a Notary takes a special combination of integrity and drive, and these fathers found the perfect partners for their mobile Notary businesses in their children. Dave Hendron, a retired law enforcement officer, was looking for ways to supplement his income when he discovered that his daughter, Irene Grimsley, a full-time nursing student and Federal Express employee, had a similar need. So they decided to start a mobile Notary business together, ID Mobile Notary (the “ID” stands for “Irene and David”). Though their mobile Notary business is still new — both were commissioned in 2013 — Dave says it’s been off to a solid start, with the pair serving San Diego and Tulare Counties in California. Dave is a signing agent and handles loan document signings while Irene handles general mobile Notary assignments. A longtime resident of Mississippi, James Franklin became a Notary signing agent in 2007 to supplement his work as a real estate agent. It turned out there was a lot of demand for notarial services in his area — in addition to loan documents, he received requests from schools, hospitals, libraries and other businesses in his area. As business continued to grow, James decided he needed another Notary on his team to help cover the workload, so he asked his son Andreas to join his company, AllDone Notary. Together, father and son handle a range of assignments including loan closings and mobile Notary work in Gulfport, Biloxi and throughout the state. Working as a father-son team has provided a lot of benefits for AllDone Notary, James said. 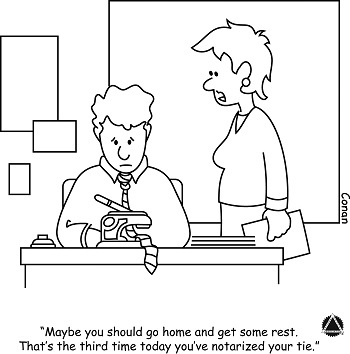 Having two Notaries available allows them to be flexible and take on more assignments because they can cover each other when scheduling conflicts arise. In fact, says James, the only problem they’ve run into is that the business has been so busy, it’s difficult for the two of them to attend family activities at the same time, since one of them is often out on assignments.